This page is part of a series of pages that consider cutting techniques used with flags (or slabs, if that's what you call 'em). The first page examined the basic principles of cutting-in: this page looks at how the cuts for a Fan Radius are prepared; related pages consider other cut features such as notches, curves and flagged radii. See the menu above right or the related pages listing at the foot of this page for a more comprehensive guide to what's available. Fan radius layouts (also known as a "Splayed Radius" or "Spoke Radius") comprise a number of "Radial Sets", which are groups of flags which are cut to create a single 'spoke' of the fan. Ideally, each spoke (radial set) should be more-or-less identical, although there may be some minor variation to make teh final set fit into the fan. There may also be variation in the precise dimensions of each set when the radius itself is not true. Fan radii are normally only used where the radius is less than 10 metres and the rotation is 45° or more. Fan radius layouts are wasted on very large radii unless the origin is obvious or is only just obstructed/occluded. Similarly, where the sweep or rotation of the radius is less than 45° it can be difficult to identify that the layout is actually a fan. The flags or paving units used within a fan radius can be cut as single tapers or double tapers, which means they have one radial edge that is cut (single taper) or two radial edges cut (double taper). It can appear, to the untrained eye, that there is little to choose between the two from an aesthetic viewpoint, but on smaller radii, or on prestige jobs, the double taper always looks so much better. Single taper cut pieces are prepared in the same way as that used when creating a ring radius, so are explained more fully on that page. Double taper cut pieces not only involve more physical work, they also require a higher degree of skill. When the origin is readily accessible, it makes the job so much easier, but on many jobs the origin will be obstructed, hidden behind an inconvenient wall or actually within a building, which may require the pieces to be cut on a temporary mock-up of the radius, which is usually a sand-bedded re-creation of the actual radius ina location where the origin can be established. Cutting a single taper fan is relatively straightforward. Each radial (spoke) of the fan is cut following on from the previous. As it is usually the leading edge that is cut, the flags to be used for the new radial set are positioned against the cut edge of the preceding radial and then marked for cutting. Note that it is possible to bed the flags in place and then cut them where they are, if using a power saw, which can help reduce the amount of work involved, but care is needed as the cutting process can sometimes disturb the flag in its alignment and/or level requiring it to be re-laid. A radial line is projected from the origin to the outermost corner of the flag adjacent to the kerb line or outside edge of the fan. This allows the cut-line to be marked and then the flags can either be cut in-situ or moved to a more convenient location to be cut prior to returning them to the fan to be laid in place. Note that because the flags of the new radial set are set square to the leading edge of the preceding set, the flag abutting the kerb or outside edge may need trimming to effect a fit. A double taper fan represents a considerable amount of work, and unlike the single taper option described above, the flags cannot be bedded and cut in position. For a double tape, each radial set has to be positioned so that the flags overlie the preceding set. Two radial lines from the origin point are projected and used to mark both the back edge, where the new radial set will abut the previous set, and the leading edge. 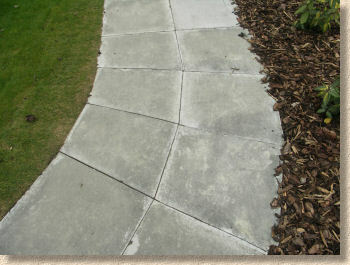 As the back edge overlies existing paving, cutting in-situ is rarely a good idea. the flags are best moved away from the fan, cut as required, and then returned to be laid into position. And note that the outermost edge of the radial set is square to the kerb or outside, so no trimming should be necessary. With the double taper option being cut on two edges, they represent at least twice as much work as would be required to construct a single taper fan or even a ring radius. Accordingly, they tend only to be used for highly decorative and/or prestige projects. In the photograph opposite, a fan radius has been double taper cut, as depicted in the diagram above. Note how, on the innermost courses, where individual flag pieces would have become exceptionally narrow and in breach of the 2:1 maximum plan ratio recommended for flags, a "double piece" has been used to replace two single pieces. This is labelled in the diagram in an attempt to make it clearer. It's also worth noting that the example shown in the photograph features staggered joints within each "spoke" of the fan, whereas the drawing shows aligned or "stacked" jointing. A staggered fan is shown below. Because a well-constructed fan radius involves a huge amount of skilled work, they are often cut in advance, using simple mathematics to calculate the angle of each cut and size of pieces required. This is particularly true for fan radii constructed from stone flags, especially those radii installed to public and commercial projects. 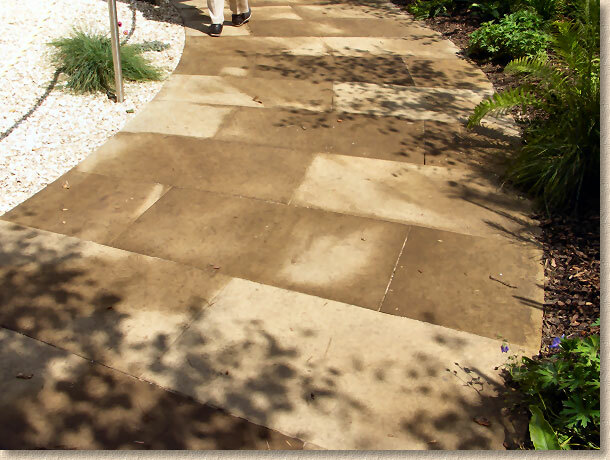 Stone flags often require a significant quantity of dressing and processing to prepare them for use as paving. It therefore makes sense to undertake the necessary taper cutting in the same factory/quarry where the dressing/processing is carried out. 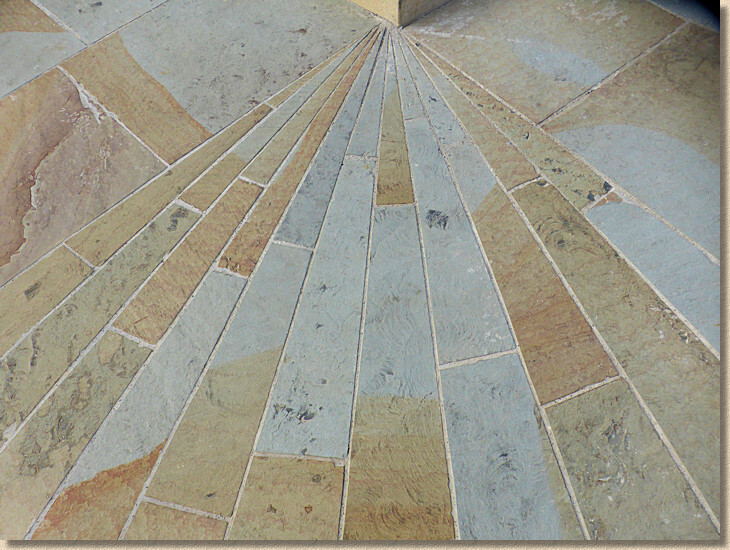 The whole radius is then delivered to site and installed in a jigsaw-like manner by the paving contractor. Where the origin of the radius is to be paved, a single piece known as a "Cap Stone" is used as the first unit out from the origin, rather than continue the spokes using ever smaller pieces reducing to nothing. This eliminates the need for excessive cutting and also eliminates the small 'darts' of flagstone that would otherwise be used. Concrete flags can also be cut off-site and delivered as a 'radius kit'. This is commonly done for the more decorative concrete flags, while the 'common' pressed flags are more usually supplied to site as standard units and cut to shape by the contractor. 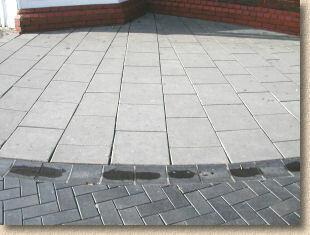 However, unless the laying operatives have a thorough understanding of the principles behind the construction of a fan radius, this can sometimes lead to paving installations such as the one shown opposite. This fan radius, constructed using F70 concrete flags, has no two spokes the same. It would seem that the laying operative has cut each spoke to suit the assumed sweep of the radius rather than have each aligned to the point of origin, even though said origin lies within the building and is therefore obstructed. While there is nothing structurally wrong with this installation, it is not as aesthetically pleasing as a true fan radius and can only be interpreted as being the work of a lesser skilled contractor with no true understanding of fan radius layout. Sadly, this is largely due to the lack of proper training for streetmasonry. In this example, which is patently of a poorer standard of work, the laying operative has almost no understanding of a fan radius and does not seem to have ever been shown how one is constructed. Uncut 'spokes' are interspersed with severely cut spokes, but as the uncut spokes approach the origin, they, too, have needed to be cut at an awkward angle to allow them to fit. Unlike the previous example, this construction is structurally incorrect. The severely cut spokes feature small, acute triangular pieces that are weak and highly likely to break. Compare this to the diagrammatic example shown above, where smaller pieces are replaced by larger pieces that cover two (or more) individual pieces, with no pieces being cut to a point, and no pieces being in breach of the 2:1 plan size recommendation. Obviously, not all applications for a fan radius will be quadrants or semi-circles. One of the most common applications that employs the principles of a fan radius, albeit on a larger but less apparent scale, is a simple curved path. As a flagged path curves one way or t'other, having the flags maintaining alignment adds to the aesthetics but is also a good indicator of the craftsman's artisanship. 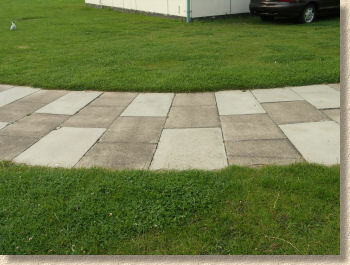 The photographs below illustrate what might be considered a 'basic' level of skill, where a simple 1200mm wide path has the B50 flags cut on a single edge to effect the change of direction. Compare this to the 2400mm wide path on the right, where the flags have had both edges cut (double taper) to form a much more visually pleasing pathway. 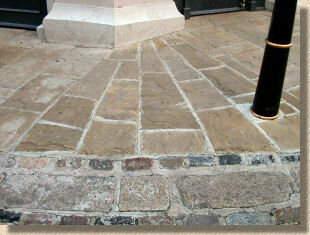 The mix of old weathered flags with newer, cleaner replacements is less than ideal, but the implementation, the way in which the flags have been precisely cut with the intention of creating a classy piece of work contrasts sharply with the 'minimal possible effort' model of the newer path. Finally, a few photographs showing fan radii used in more decorative situations. 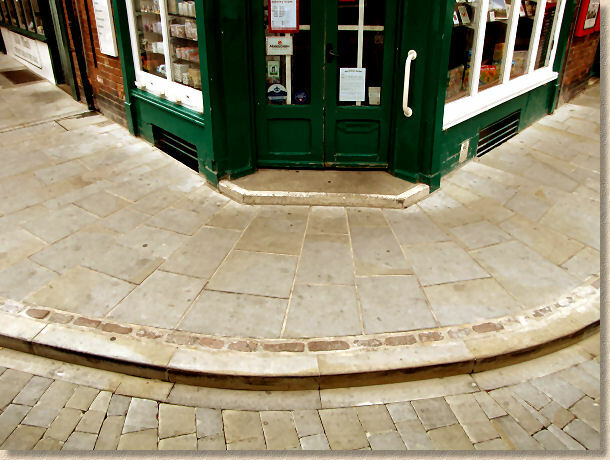 On the left, a small radius constructed from reclaimed flagstones and installed in what is increasingly being referred to as a "Heritage Area". The workmanship is fair, and the contractor obviously understood the principles involved, although the pointing around the setts and kerbs (which may have been installed by a different tradesman) leaves something to be desired! 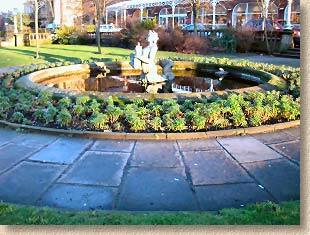 On the right, a fan radius laid as a perimeter ring around a garden feature. It should be apparent that these concrete flags are relatively old, quite probably in excess of 50 years, as evidenced by the surface texture and the crumbling at the arrisses. At least one flag has been replaced with a more modern unit. 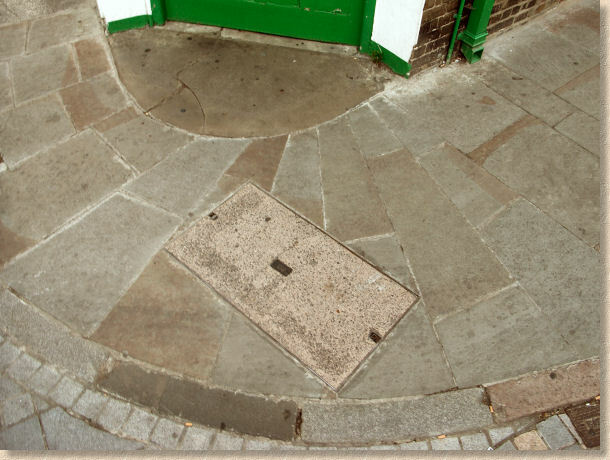 While it may have been simpler to construct this pavement as a ring radius, it was originally laid at a time when skill and craftsmanship of a streetmason were considered with far more respect and the tradesman has used this relatively simple and unimportant project to showcase his skills. 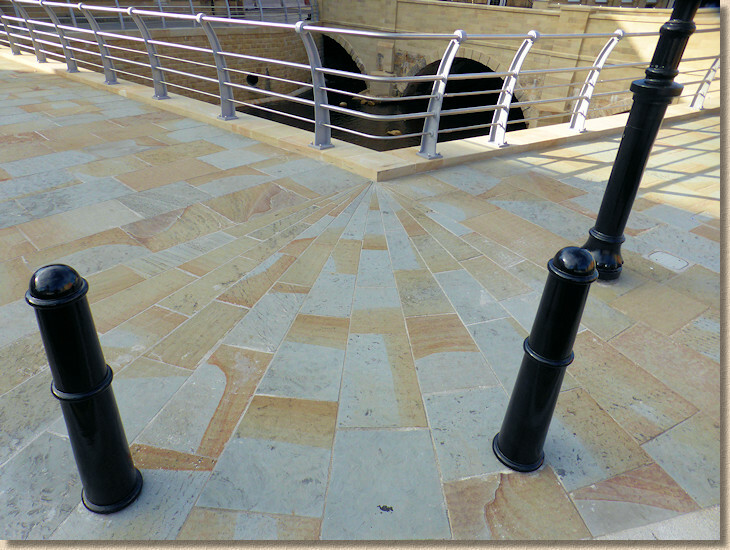 A small, fast radius fan constructed from reclaimed yorkstone paving. 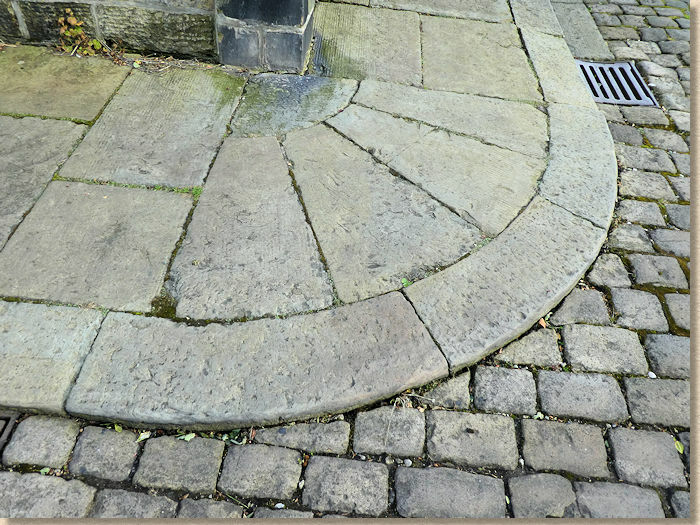 In this example, the (slightly damp) flagstones have been precision cut off-site to create a curving pathway of shotsawn yorkstone with minimal jointing (3mm sand-filled, if you must know). Careful and precise garden design allows the flagstones to be custom prepared at the quarry and delivered to site as a kind of jigsaw-puzzle, ready to be put together to form the perfect pathway. 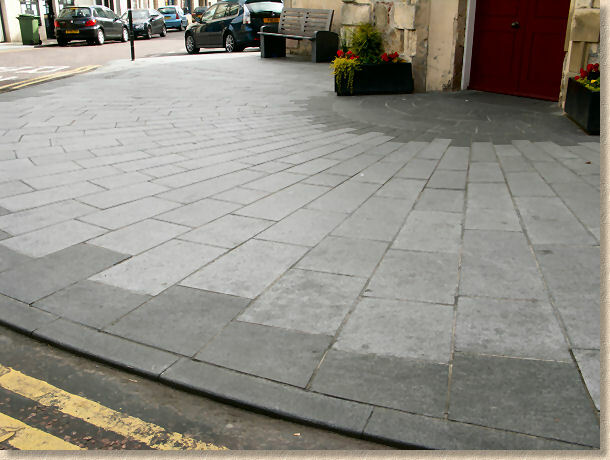 This four-spoke fan radius formed from Caithness Slate is a perfect example of a factory-prepared pavement section, cut and prepared to specific dimensions and then fitted on site against a bush-hammered granite kerb. If ever there was a case for using a recess tray cover...why go to all the trouble of cutting a millimetre-perfect fan radius from flamed Greenmoor Yorkstone, only to have a god-awful nasty concrete-covered telecomms access box slap bang in the middle of it? This image from Lincoln shows how it can look when you omit the telecomms nonsense! 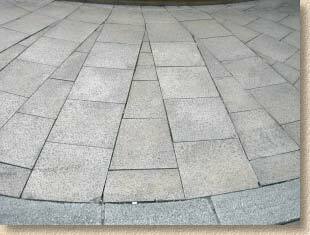 A superb example of the art: a granite fan radius in the centre of Lanark. 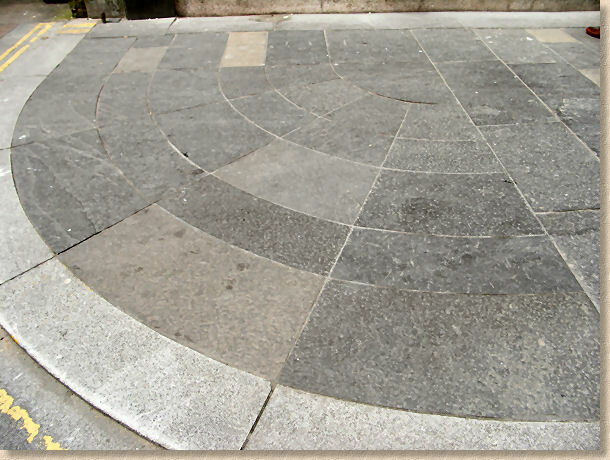 At its origin around the main doorway of the building, a ring radius in darker granite has been used, which then switches to a mid-grey granite fan radius when the diameter reaches around 3 metres. Each spoke is cut to perfection and the detail is completed by switching back to the darker granite for the final piece adjacent to the matching bull-nose kerb. The oil stains detract from its inherent good looks, but even so, it remains a thing of beauty. Some layouts prefer to omit the traditional cap stone in favour of taking the spoles right back to the origin. 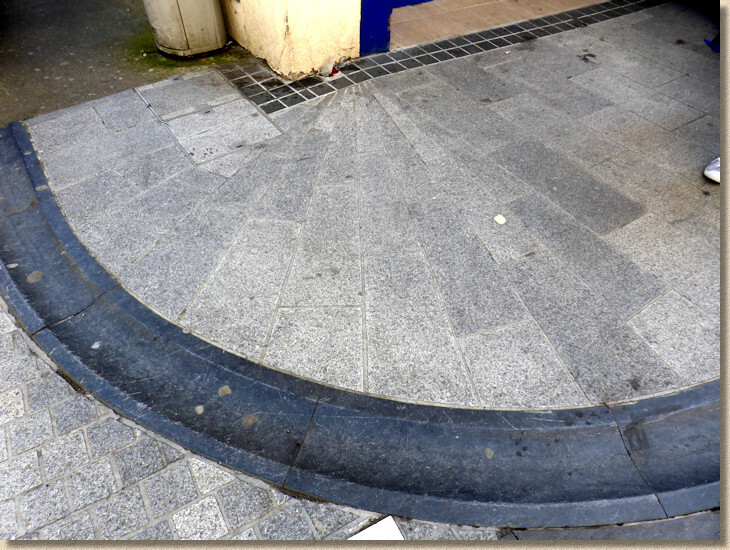 A fan radius cut from granite on the main shopping street in Wexford. The committment to use a fan radius on what is a relatively narrow path, and to cut it so that the origin is evident, is a real testament of skill. Thousands of people will trudge over this each year without realising what a special piece of work they are missing.....but some of us appreciate it! The radius dished channel in a dark 'blue limestone' significantly helps with the definition against the somewhat more poorly laid granite setts of the carriageway, but note also the very discreet use of a recess tray cover in the return section. All indicators of genuinely classy workmanship. Another superb example of the art - this time using a flamed yorkstone and sited on the corner of a bridge over the recently uncovered River Roch in the centre of Rochdale, Lancashire. Precsion cutting taken right back to the origin, shown beneath. There is some debate over whether such small pieces are warranted when a larger cap stone might be more robust. 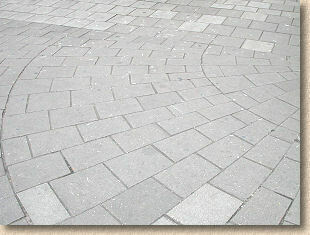 Traditionally, a cap stone would have been preferred, but with modern laying techniques founded on reliable bedding and jointing mortars, designers are increasingly confident that such delicate slices will survive the rigours of town centre life.